The Amazon Fire HD 8 2018 8th generation is an 8-inch Android tablet that is very inexpensive. Among its highlights are its price starting at just 79.99 US Dollars and Alexa hands-free support. You can also get it with a Show Mode Charging Dock that transforms the tablet into an Echo Show. Here is everything you should know about the Amazon Fire HD 8 2018 including the full specification sheet and possible alternatives. The Amazon Fire HD 8 2018 is an 8-inch tablet with a full plastic body that is just under 1cm thick. According to themselves, it is more robust than an iPad Mini 4. While it is still charged using a micro USB port, we also get a standard headphone jack and a micro SD card slot. Amazon’s Fire HD 8 has an 8-inch IPS screen with an aspect ratio of 16:10 and a resolution of 1280 x 800 pixels. We get a 1.3GHz MediaTek quad-core processor with 1.5GB of RAM and a 16GB or 32GB internal storage. Obviously, it supports WiFi and Bluetooth. Both cameras have a resolution of 2 megapixels. Even though the Fire HD 8 2018 is running Android, it is Amazon’s version of Android and not Google’s Android. Instead of the Play Store, we get the Amazon App Store. And instead of Chrome or YouTube, we get the Silk browser and Prime Video. Most services of Amazon are deeply integrated into the operating system. Those include Kindle eBooks, Audible audiobooks and obviously the standard Amazon store. If you want, you can install the Google Play Store manually yourself. However, you might be voiding your warranty. Another software feature is Alexa Hands-free. With that one, you can use the voice assistant when the screen is turned off too. You can get the Amazon Show Mode Charging Dock as an optional accessory for your Fire HD 8 2018. You can use it to kind of transform your tablet into an Echo Show. At the same time, it is charged when placed inside the dock. The Amazon Fire HD 8 2018 8th generation went on sale in the United States and across Europe in October of 2018. In the US, prices start at 79.99 US Dollars while you have to pay 89.99 Euros in Europe. There are two direct alternatives to the Amazon Fire HD 8 2018. The Lenovo Tab4 8 and Huawei MediaPad T3 8 are two very similar tablets with almost the same hardware. However, they are running normal Google Android. You have to pay a bit more for that though. 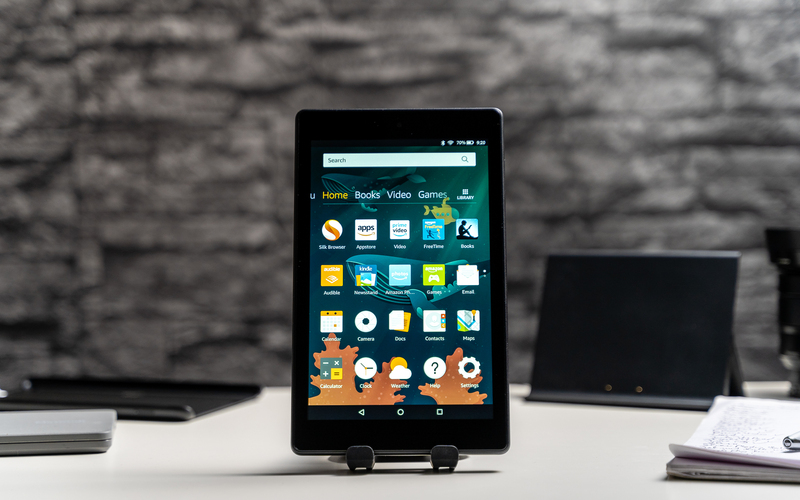 In case you are looking for something bigger, you could check out the Amazon Fire HD 10. While that is more expensive, it also has a better screen and much better performance. Even though the Amazon Fire HD 8 2018 is far from perfect, it is a great value starting at just 79.99 US Dollars. While the screen is a bit dark, it is sharp enough due to the HD resolution. The performance is good enough for basics, the battery life is great, and it supports Alexa Hands-free now. As an option, you can get it with a Show Mode Charging Dock. However, you have to install the Play Store manually if you need Google apps.